A new gallery at the Indira Gandhi National Centre for Arts will showcase the master's photographs of lifestyles of the rich and royal in British India. Raja Deen Dayal (1844-1905) will always be remembered for capturing unforgettable memories of the splendours of the lifestyles of the Rajas and the Burra Sahibs of 19th century India through the lens of his camera. And to frame these images of luxe and grandeur, the Indira Gandhi National Centre for the Arts (IGNCA) this month opened a permanent gallery to showcase the works of the celebrated 19th century photographer. The gallery is located in two rooms of the upper basement level of the mammoth, red sandstone IGNCA building on New Delhi’s Mansingh Road; entry to the gallery will be free. The 20 large format digital prints showing palace interiors, impressive monuments, portraits, hunters’ trophies on display are a treat for the eyes. There are two glass-plate negatives with their special mystique on view too. The recreation of a studio set with its behemoth of a camera has immense potential as a display area. The photos evoke a period as nothing else can. While this attempt to highlight the institution’s treasures of early photographs is to be appreciated, the display merely whets the appetite, offering only a glimpse of the riches that IGNCA holds in its reserve collection. Since 1989, the cultural archives of the IGNCA have held in its inventory, 2,857 glass plate negatives, 200 studio prints done in Deen Dayal’s and his heirs’ time, to say nothing of studio registers, certificates and letters of recommendation, cameras, lenses, a range of studio props and furniture. In short, IGNCA holds an invaluable archive of India’s early photographic history. Given the cachet Deen Dayal’s work enjoys today, not only for its artistic merit, but also as a source material for the social history of 19th century India and given its particular importance to scholars of photography, the display merely titillates and in the end leaves the serious viewer dissatisfied. The arrangement of the objects on display appears somewhat makeshift, as if the curator and the exhibition designer were working under budgetary constraints. The low-ceilinged rooms do little to focus on the magnificence of imagery that Deen Dayal sought to evoke. A thought should be given to the lighting. One wishes that the objects could have been shown with a little more finesse. Perhaps, the services of a good professional designer would have created the right setting for Deen Dayal’s works and equipment. IGNCA could charge a small entry fee to cover costs. 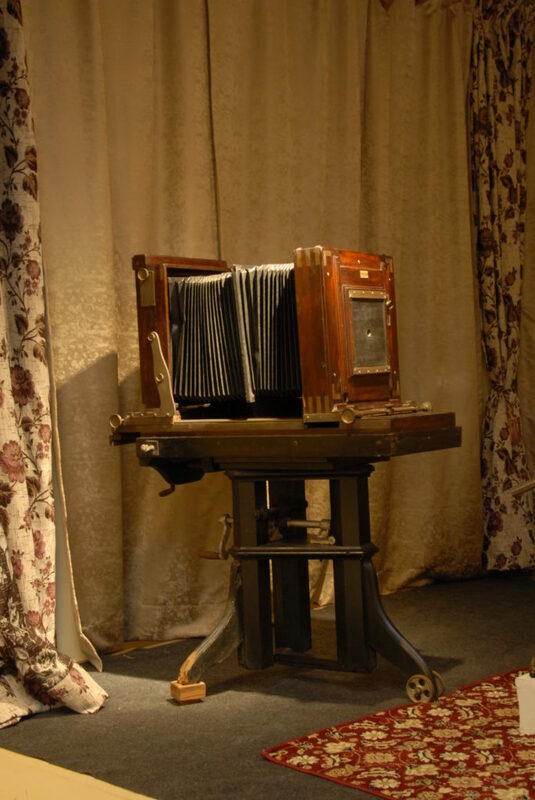 Large format camera on display. Yet, without doubt, the decision to showcase Deen Dayal’s work is timely. One observes a growing historical interest in his oeuvre. Historian Sunil Khilnani, in his recent book Incarnations has written an essay on Deen Dayal. In the concluding remarks of the piece, Khilnani sums up the photographer thus, “Dayal was master of the medium that would entirely transform how we see andrepresent the world … Dayal’s body of work matters for history as much as for art. Without him we wouldn’t understand so powerfully the moment when India was the world’s exotic, wondrous playground for the wealthy – before the modern world got in the way.” One must remember that the idea of the ‘picturesque’ still held sway over world imagination in the second half of the 19th century, at least through its early decades. Deen Dayal was born to a Jain family of jewellers in Sardhana, near Meerut, in 1844. He completed a civil engineering course at Roorkee College of Engineering and was appointed in the public works department at Indore. Right from the beginning of his career, Deen Dayal took an interest in photography. Perhaps, he became curious about the technology while he was still at college where photography was introduced as a course. 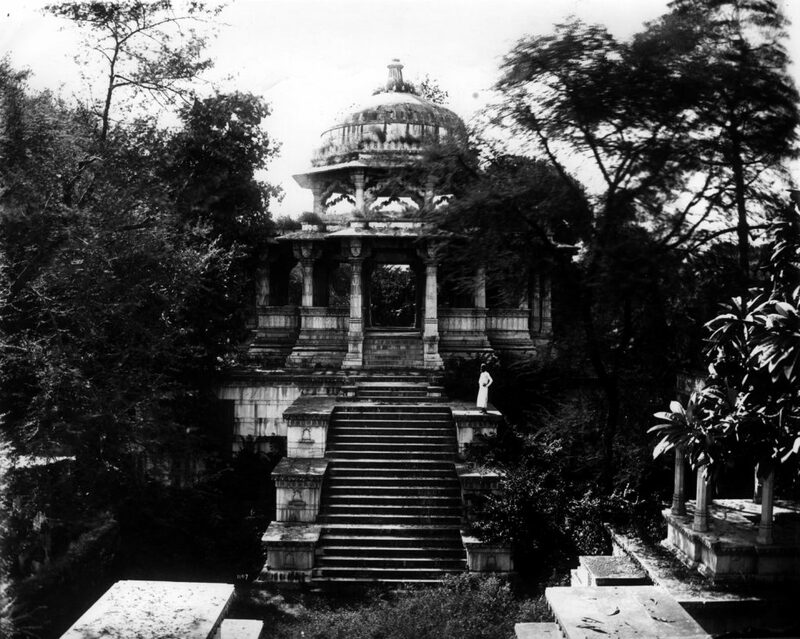 Deen Dayal began taking photographs of the monuments of central India using the glass-plate technology which had then arrived in India. An intelligent and observant man, he must have studied the way the notions of the picturesque and the exotic shaped the British imagery of the time. He innovated with these values in his own work. Take the photograph ‘Cenotaph of Raja Sangram Singh of Alvar’. According to the label, it was shot c.1882-1886. The image of the dilapidated medieval building framed by nature’s wilderness distills the essence of the romantic movement in art with its passion for the picturesque that swept through Europe in the early decades of the 19th century. Its influence lingered on the shaping of taste even in the latter half of the 19th century. Deen Dayal took up photography as a profession in 1874. So skilled was he with the use of light, the angle of vision and handling of the unwieldy equipment at a time when photography was still in its infancy in India, that he had no problems getting work. Both princely India and the British ruling elite, civil and military, gave him commissions. Deen Dayal took inspiration from how the British photographers conducted business. For instance, like the British photographers, he also included a zenana studio in his establishment in which women photographers were employed thus encouraging women from respectable families to have their photos taken. Deen Dayal added many such touches which made his clientele happy. Indeed, familiar with the patron-artist relationship in the Indian royal courts, he excelled in pleasing his patrons, be they Indian princes or British viceroys, senior officials and generals. 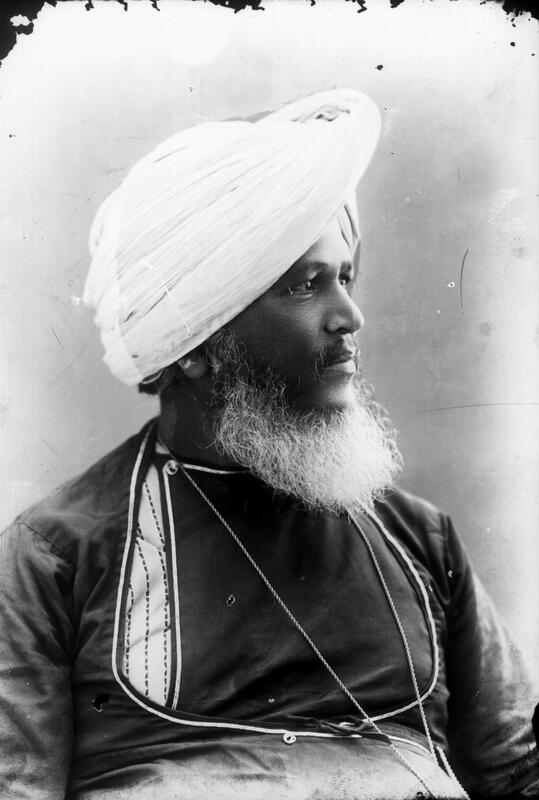 In 1884, Deen Dayal was appointed court photographer to the sixth Nizam Mir Mahboob Ali Khan in Hyderabad. Three years later, he received the royal warrant of appointment as photographer to Empress of India, Queen Victoria and three years after that, in 1900, he received a similar appointment to King Edward VII. One reason for this felicitous relationship with patrons is perhaps the quality of representation that he achieved. He captured the pomp and glory that one associates with his exalted patrons. This aura manifests not just in the portrait photographs, but also in the images of the luxurious palace interiors with their glittering chandeliers, gilded furniture, lavish carpets and silken drapes. 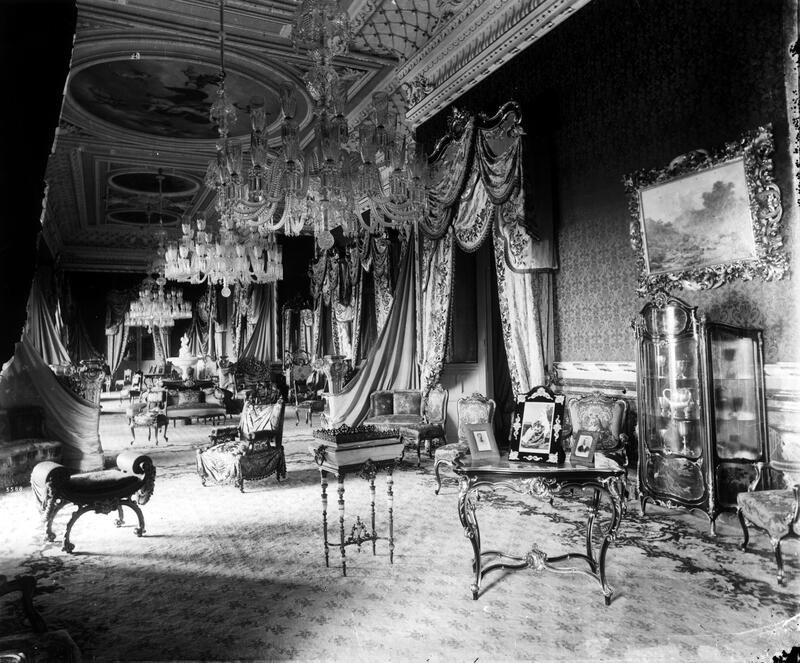 The models for such interiors were created by the British, and assiduously copied by the Indian aristocracy. The Mughal darbar was no longer a template. There was another theme – hunting scenes – that underscored male dominance and power. No doubt, the images of the hunter with his trophy tickled the ego of his powerful patrons and eased the opening of the purse strings. By extension, the photographs of the courtesans were also projections of male hubris as they drew attention to the power of the protector. In contrast, the British elite commissioned photographs of picnics, garden parties, children’s parties to project images of an idyllic life of the privileged. In his strategies of travelling through the countryside in search of commissions, Deen Dayal’s approach is reminiscent of the artist Raja Ravi Varma who also travelled to the princely courts throughout India for a similar purpose. Working at a twilight time when the ways of traditional princely India were fast vanishing and being replaced by a style set by the new British ruling elite, both Deen Dayal and Ravi Varma knew the traditional artists’ ways of seeking patrons and quickly learned how to negotiate with the new rulers. Not surprisingly, there appears to have been a little rivalry between the two. Ravi Varma’s brother Raja Raja Varma had noted in his diaries how the Varma brothers had to hang around for two months in Hyderabad in 1891 without getting access to the Nizam’s court. For Ravi Varma, who had been lionised in Baroda and other courts, this was a slight that rankled. With his use of new technology, Deen Dayal captured a bright, glossy reality to please his wealthy, powerful patrons. Over a century later, the images fascinate collectors, add value to museum collections and beckon scholars. Nevertheless, they are confined to the walls of elite spaces. Ravi Varma, on the other hand, painted royal and aristocratic portraits, ideal forms of female beauty and dramatic scenes from mythology employing the language of academic realism. In the process, he was able to colonise popular imagination as no other artist has been able to. Even in Bollywood cinema the heroines were cast in the mould of the bosomy, heavy-hipped Ravi Varma models till as late as the 1960s. Artist A. Ramachandran says that this was so because Ravi Varma painted gods, goddesses and mythological scenes. This accounted for his huge popular appeal. True, but Ravi Varma also used another kind of technology to enter the average Indian home. He set up a lithographic press thereby reproducing his paintings in large numbers, thus reducing their prices and making it possible for the ordinary Indian to buy his images. It is interesting that the 19th century influence of British aesthetics on Indian artistic imagination yielded such divergent results.